EZ Sensor Cleaning Kit. The perfect gift for any photographer. 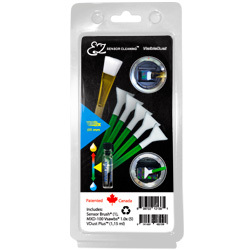 EZ sensor cleaning allows removing water and oil stains efficient and safe way. The perfect gift for any photographer. 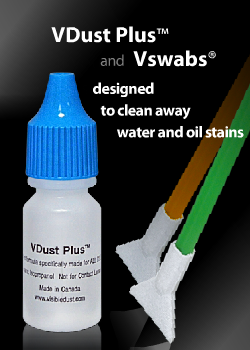 EZ sensor cleaning VDust Plus™ multi ingradient, Iso alcoholic solution, removes oil fast, evaporates fast, streak free motion compatible with both DHAP orange and Ultra MXD-100 green Vswab. Green MXD-100 Vswab patented V shape results best maneuverability inside chamber, V shape results in homogeneous motion, it cleans corner the best due to its V shape, compatible with all three solutions, multi fabric ensures best results for oil and smear removal, its soft texture is safe on coated sensor, best used for fluorine coated sensor, streak free motion. SCF is an acronym for Super Charged Fibers and it is the name that VisibleDust has given to the technology it developed when creating the special fibers used in its Sensor Brush®. The charge draws the dust away from the sensor onto the bristles.